From the beginning of his career, Alfred Hitchcock wanted to be considered an artist. 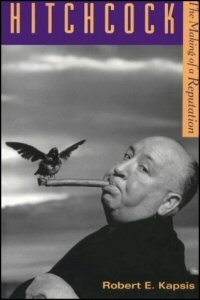 Although his thrillers were immensely popular, and Hitchcock himself courted reviewers, he was, for many years, regarded as no more than a master craftsman. By the 1960s, though, critics began calling him an artist of unique vision and gifts. What happened to make Hitchcock's reputation as a true innovator and singular talent? Through a close examination of Hitchcock's personal papers, scripts, production notes, publicity files, correspondence, and hundreds of British and American reviews, Robert Kapsis here traces Hitchcock's changing critical fortunes. Vertigo, for instance, was considered a flawed film when first released; today it is viewed by many as the signal achievement of a great director. According to Kapsis, this dramatic change occurred because the making of the Hitchcock legend was not solely dependent on the quality of his films. Rather, his elevation to artist was caused by a successful blending of self-promotion, sponsorship by prominent members of the film community, and, most important, changes in critical theory which for the first time allowed for the idea of director as auteur. Kapsis also examines the careers of several other filmmakers who, like Hitchcock, have managed to cross the line that separates craftsman from artist, and shows how Hitchcock's legacy and reputation shed light on the way contemporary reputations are made. In a chapter about Brian De Palma, the most reknowned thriller director since Hitchcock, Kapsis explores how Hitchcock's legacy has affected contemporary work in—and criticism of—the thriller genre. Filled with fascinating anecdotes and intriguing excerpts, and augmented by interviews with Hitchcock's associates, this thoroughly documented and engagingly written book will appeal to scholars and film enthusiasts alike.